At the Center for Physical Excellence, Physical Therapy and wellness, we strive towards achieving life changing transformations one small victory at a time. Our entire staff is here to help you attain your goals through hands-on manual physical therapy techniques, therapeutic exercises and advanced treatments. We are a state-of-the-art orthopedic and sports physical therapy facility, centrally located in the Quad Cities area servicing Prescott, Prescott Valley, Chino Valley and Dewey-Humboldt of Arizona. 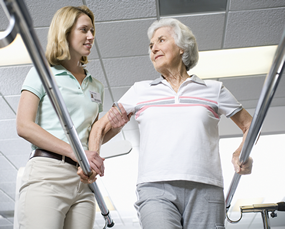 We take great pride in providing a high-caliber physical therapy practice to Yavapai County. We offer sports and orthopedic manual physical therapy with individualized exercise prescriptions. With your personal goals in mind, our skilled staff create the right treatment for your orthopedic needs. We provide physical therapy services to children and adults for a wide spectrum of physical therapy treatments; including athletic and work injuries. We see clients with joint problems, spinal dysfunction, pre- and post-surgical challenges, as well as those who are seeking a more active lifestyle but suffer from movement dysfunction(s). Our facility is the only private practice physical therapy office in the Prescott area with a separate wellness center utilized for preoperative care and education, wellness training and fitness services. The Athletic Performance Center is fully equipped for any fitness needs with free weights, Cybex® equipment, cardiovascular and endurance training equipment along with specialized equipment for post-physical therapy exercise programs. Each of our clients are provided a two week membership to the Wellness and Fitness Center upon completion of their physical therapy care. This environment provides an excellent transition to independent self-care, maintenance/enhancement of health and overall wellbeing of our clients. Center for Physical Excellence is the first facility in the Quad Cities area to build a salt water aquatic therapy pool and offer on-site water-based rehabilitation services to our community. Our aquatic services have expanded to a much larger multi-depth pool at our Prescott Facility located in the Crossings. In addition to Aquatic Physical Therapy we also offer Arthritis Foundation™ Certified Water Classes along with other water based classes to our Wellness and Fitness Center members. We have a large multipurpose room with specialized flooring that is home to Jazzercise, Yoga and other fitness/exercise classes for all age groups. This multipurpose room is also utilized for patient care, lectures and sports-specific agility training. Our 5,000 sq.ft. outdoor “sand lot” provides an ideal area for gait training on uneven terrain, running and agility training. This area is also utilized for athletes wanting to return to sports, focus on throwing, as well as high level plyometric training for the upper and lower extremities.